Sophie is so observant. When Keegan came to visit, her mom changed her on a changing pad on the rug. I was amazed to come into the family room the next day and Sophie had laid out a book, which looked just like a changing pad, and put her baby on top of it. 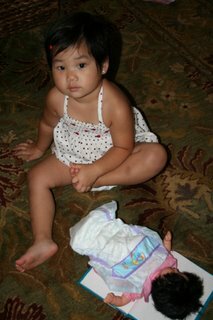 She was trying to put a diaper on the baby and I knew immediately what she was trying to do. This kid is so observant. Sometimes I worry that she tries to ‘take care’ too much and can’t fully enjoy being the barely-beyond-a-baby stage of two. I so want her to have times where she can allow herself to be loved and cared for without worrying about caring for someone else. I was so tickled when, just a few days ago, she announced to me “XiaoXiao baby”. It was clear she wasn’t talking about her baby, but her being the baby. I said “Yes, XiaoXiao is momma’s baby”. She continued and said “MeiMei baby” and I said “Yes, MeiMei is momma’s baby too”. She seemed happy with this and has since told me several times that she is the baby. That is sooo cute about the changing pad story. I am amazed at what Sophie learns without us consciously teaching her. The other day I saw her holding a hair bow against her sleeve…she’d seen her older sisters looking for ones that match their clothes. Yup, they hold them against their sleeves to see if they match. Too funny. :o) It’s so beautiful to see our girls just seeming to melt into our families, and fill up the missing places that we didn’t know were there.